2003 Adobe launches its Creative Suite software suite, the Canon 300D changes the camera market. JDF 1.2 gets a lot of attentiona at drupa, Agfa introduces its first chemistry-free CtP plate. In 2005 Acanthus Holdings Ltd was formed and the current Shareholders completed a management buy-out of Acanthus Press, at the same time Finish Line was incorporated into the main company. Kodak takes over Creo, Adobe acquires Macromedia. Screen introduces Truepress Jet520 to launch high-speed commercial colour inkjet printing. 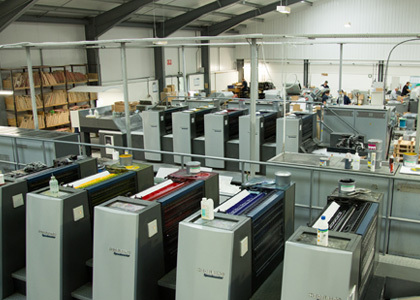 Acanthus ventured into the digital print market in 2007 with the purchase of a HP Indigo 5000 press. This decision was taken as the industry wide demand for shorter production runs and quicker turnarounds increased. First iPhone launched. Dropbox is founded. As Acanthus reputation for quality and service blossomed, turnover increased and it became clear that the business would outgrow its premises, so in 2008 it relocated to its current home, a 14,000 sq ft facility, just two miles from its original home. Significant purchases were made at this time, with two new 5-colour B2 Heidelberg presses installed as part of a £1.6 million investment. The company also invested in chemical free plates, became a member of the FSC and installed 200 solar panels that help produce the power and lower the carbon footprint significantly. At DRUPA 2008 the focus lies on fast inkjet printers, ‘Sustainability’ and ‘Go green’ are the hype of the year. Further investment followed in 2011 with the purchase of an automated mailing machine as greater demand for fulfilment services and personalised items off the digital press increased. Heidelberg and Ricoh announce their cooperation in digital printing. After adding the ability to print full colour envelopes with a fixed head inkjet printer, Acanthus invested in a larger format digital press from Heidelberg with a 5th unit for spot white and varnish. HP have more floorspace at DRUPA than Heidelberg in what is seen as a shift towards high volume digital as many vendors showcase inkjet presses.